Your kitchen project deserves to be treated with personalized service and attention to detail. Beginning with our first contact, our design team will meet with you in your home to discuss your ideas and goals. All of our craftsmen are fully trained to handle your requests and work with you to attain your customized dream kitchen. As a local family owned business, we are committed to providing our clients with the highest level of customer service and workmanship to ensure all phases of the project will be completed seamlessly. We invite you to scroll down and view our videos on how we can completely bring your kitchen design vision into reality with our comprehensive approach. Ackley Cabinet LLC is a unique remodeling company that transforms your existing kitchen cabinets into new custom cabinetry. Learn why homeowners have chosen our company for over 40 years to achieve their dream kitchen. Just in time for the holidays, we completely transformed our Danbury CT client's dated creamy oak cabinets to a rich and stunning honey cherry kitchen. Using our exclusive Forefront process, we were able to save the granite counter-top and retain the overall foundation, all while updating the look and feel to new custom cabinetry. Part1 - This Cross River, NY customer had fairly well built and well installed cabinets. While still in great condition, they looked outdated. Part 2 - Watch us transform our client's existing cabinets with our innovative approach to kitchen remodeling! Part 1 - Watch us transform our client's existing cabinets in Ridgefield CT with our innovative approach to kitchen remodeling! Stay tuned for part 2 where we reveal the "After" shots and completed kitchen project. 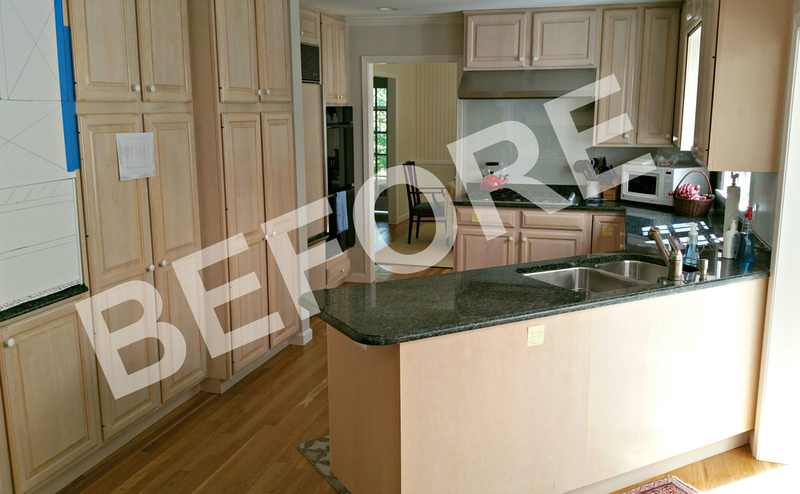 Part 2 - View the completed transformation of our client's Ridgefield CT kitchen! Check out this BEFORE video of a kitchen remodeling project we completed for our client in Ridgefield CT. We will be updating these oak cabinets to a sleek white modern cabinet style. Check out this AFTER video of a kitchen remodeling project we completed for our client in Ridgefield CT. With new custom designed white cabinet doors, molding, trim, drawers and hardware, this modern kitchen is a stunner! By enclosing the open soffit and extending the kitchen cabinets to the ceiling, this space now feels significantly more open and gives our client added storage as well. Curious about how to live through a kitchen remodel? See how our unique approach minimizes hassle on our New Canaan CT project, so you can get custom designed cabinets conveniently! Wondering where to store all your items during a kitchen remodel? Find out why we advise our clients to setup a "mini kitchen" in a nearby room to maximize convenience at our New Canaan CT project! We are half way through our kitchen cabinet remodeling project in New Canaan CT. Check out the progress and stay tuned for the "After" video! Check out our completed kitchen cabinet remodeling project in New Canaan CT! Stay tuned for the final reveal once the counter-tops and back splash are installed!